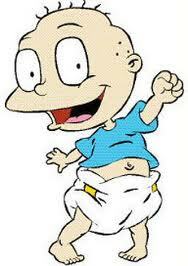 Thomas "Tommy" Pickles is the leader of the babies, often translating everything adult into baby gibberish. He's best known for his bravery and adventure-seeking attitude. He's extremely playful and will attempt to do anything in order to have an adventure. He's very loving and protective towards his friends, and especially protective when it comes to his little brother, Dil Pickles. He's idolized by the other babies, exhibiting the qualities of a natural leader. Although he's adventurous and very clever for a baby, he can be a little short-tempered and at times, act a bit stubborn. While Angelica is synonymous with Freud's id and Chuckie parallels the superego, Tommy is definitely the embodiment of Freud's ego. While the superego represented by Chuckie abides by the rules, is fearful of repercussions, and is basically the "angel" of the personality and Angelica's id is aggressive, unruly, and forceful, Tommy is the middle ground: the ego, which is the balance who mediates between the unrealistic id and the external real world. The ego is the the decision making component of personality. Ideally, the ego works by reason whereas the id is chaotic and totally unreasonable. The ego operates according to the reality principle, working out realistic ways of satisfying the id’s demands, often compromising or postponing satisfaction to avoid negative consequences of society. The ego considers social realities and norms, etiquette and rules in deciding how to behave. Tommy is the perfect example of the ego because he indeed seeks to satiate his desires to explore and adventure riskily, however, he easily points out Angelica's idish tyranny, and is kind and reasonable towards the other babies and his adventures. Like Phil and Lil, Tommy for some time, seemed to be suffering from Sibling Rivalry Disorder. When his younger brother, Dil was born, Tommy (as the older brother) became immensely jealous, competitive (for his parents' attention), and threatened. In The Rugrats Movie, after Dil is born, he quickly becomes a very spoiled baby, crying non-stop for attention, keeping all of the babies' toys for himself and refusing to share with Tommy. Stu, Tommy and Dil's father, has a conversation with Tommy about being a big brother and the responsibility he now has and assures him that one day he'll be happy to have Dil as his little brother. In the movie, when the babies get lost, Tommy eventually finds Dil during a storm, and is forced to take shelter under a tree. However, Dil's selfish acts pushes Tommy too far and causes him to snaps at Dil. Both the storm and Tommy's rage scare Dil, who turns over a new leaf; and the too reconcile and become closer. In the episode, A Dose of Dil (video below), Tommy feels left out as the adults are giving Dil all the attention because he hurt his finger. Tommy and the gang decide to find ways to get the attention of the adults because they believe that if they do, they will get lollipops, as Angelica shows off that she has loads of lollipops. However, by the end of the episode, Tommy realizes that he doesn't need to cry for attention anymore because his little brother Dil will always be there to listen to him.